GlobMarble offers decorative concrete material including concrete countertop and casting pourable mixes- high early strength pre-blended two component mix designs. GFRC – glass fiber reinforced concrete including sprayable face coat with a fiber rich backing mix for unparalleled strength. Overlay mixes. Lightweight architectural concrete mix to reduce weight by 40% to 60%. Fire resistant due to vermiculite dosage. 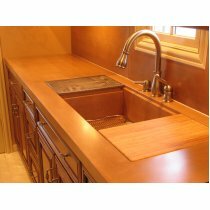 Food safe water based and solvent based concrete sealers to protect countertops, wall panels, floor tiles, and much other concrete and natural stone surfaces. Precast concrete colors and concrete casting accessories and additives.